Crashes are very, very stressful. Throughout the chaotic aftermath of a crash, you may experience a heightened sense of fear and loss of control, especially if there are serious or life-threatening injuries. All parties involved may exhibit everything from stunned, shocked silence, to tears or extreme aggression. Sometimes, the anger and aggression will be directed at you. The only thing you can control is you – your behavior, your reactions and emotions. You are most likely the first professional on the scene. 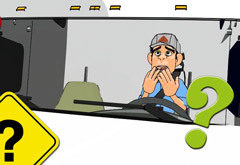 Being a commercial driver, you are well trained in assessing the situation, securing the scene, and gathering the facts. 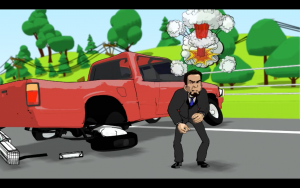 If you have seen AccidentPlan’s training videos featuring Skidmore, you have even had training on behavioral conduct at the scene. However, since your interactions with others during this time can have a severe impact on you and your company, such as civil and criminal ramifications and increased insurance claims, we thought a few reminders in conduct protocol would be helpful. Never say “I’m sorry” to anyone, even if you think you are at fault. For many of us, this is an automatic response to someone’s pain or aggression. It is how we convey compassion. However, this one little phrase can be used against you as an admission of guilt. If you feel a “sorry” coming on, please stop. Say nothing at all. Walking away is always a good option. Ask the other drivers if they are OK. Showing concern is the right thing to do. 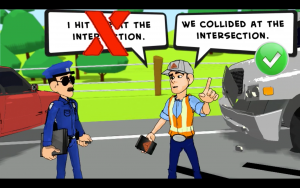 However, do not discuss the accident details. Do not express anger or frustration if you believe they are at fault, nor should you take any responsibility for the accident. Attend to the injured according to your training and abilities, follow your AccidentPlan protocol and remain calm. If you are confronted by an angry or aggressive person, do not respond with anger, or tell them to calm down. It could escalate the situation. In fact, do not respond at all. Let law enforcement manage the situation. If police have not yet arrived, try to stay focused on following your crash protocol. Do not engage, no matter what is being said to you or about you. Before law enforcement arrives is a good time to review in your own mind the details of the accident. Take a few slow, deep breaths. Make a conscious effort to relax your face, neck and shoulders, and try to steady and lower the pitch of your voice. This helps you gain composure and think more clearly. Talk only to law enforcement. State only the facts and do not admit fault. Consider each phrase carefully. According to transportation litigation attorney Daniel Bristol, Special Counsel at Denver based Hall & Evans, there is a big difference between “we collided” and “I hit her”, or “traffic had come to a sudden stop” and “I only looked away for a second”. This is not the time to discuss or even consider fault. If there is an investigation, the truth will come out in time. Do not interrupt the officer or involve yourself during their interview with the other parties. It is the officer’s job to get both sides of the story. Even if you do not agree with what is being said, keep quiet, be respectful and keep your distance. You still need to complete your report. This involves exchanging information. If everyone is calm, continue with the exchange. However, don’t approach the other parties if they are still in an agitated state. Let law enforcement get that for you. Gather what you can, such as pictures of the license plates and VIN numbers. Don’t talk to the media – ever. Refer them to your supervisor. Remember, nothing is ever “off the record”. And for goodness sake, do not post any crash details on social media. What is posted on Facebook stays on Facebook and can be used against you in court. Remember, the loss of situational control can bring on a slew of emotions in everyone involved. You are a professional. Choose to remain calm, cool-headed and quiet and you will get through it. Schedule a demo and learn more about how AccidentPlan can help.